UAE is known for providing best and favorable business opportunities for businesses around the world. Apart from that, the country is also known for political and economic stability. It is the reason that entrepreneurs from around the world are heading towards UAE (especially Dubai) for taking advantage of immense business opportunities. Apart from that, many foreigners (including highly rich people) have permanently settled in UAE in order to enjoy best law and order situation, health facilities and entertainment places in the country. UAE is also visited by millions of tourists every year. All these factors are contributing in the overall economic growth of UAE and its people and the fact is evident from the latest report of a global market research group. New World Health has specialization in wealth statistics and the organization tells that the combined wealth of residents in UAE is around $925. It means that the household assets in the country increased by 10% in just one year while increase in the assets was over 60% in just a decade (2007-17). It is the total amount of wealth that is held by people of UAE that range from poor to millionaires. This amount is taken by measuring price of cash equities, business interests, villas, flats, cars etc. that are held by all the citizens and residents. But all the government funds are excluded from this figure. 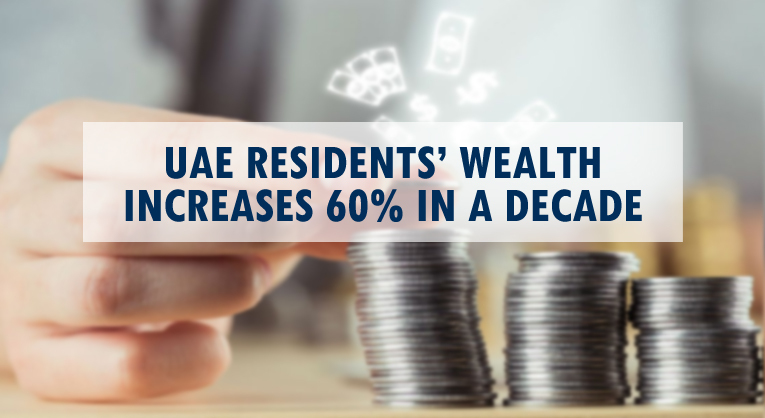 The research group mentioned that the important reason behind the continuous growth of personal wealth of UAE residents is the arrival of millionaires in the country from all parts of the world. Alone in 2017, around 5,000 millionaires shifted to UAE which is the third highest number of millionaires that shifted to any country in the previous year. In this aspect, UAE is just behind Australia and USA and levels with Canada. But the influx of millionaires is not the sole reason for increase in wealth of residents of UAE, but it indicates the overall rise in the prosperity of Dubai and its people. There are many people from underdeveloped countries that visited UAE for financial reasons and they achieved their goal of becoming wealthy after taking advantage of the opportunities available in UAE. This is a clear indication that economic and political condition of UAE is beneficial for everyone, which also includes the ultra-rich.